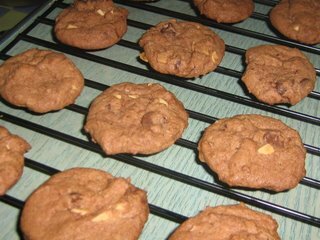 I have to admit this is the best choc cookies dat I have ever made and I will stick by this recipe. I made ABC - Almond Brownie Cookies yesterday. Actually my initial plan was to bake either a Marble Cake or Zebra Cake. I took the butter out from the fridge to put to room temperature but when the time comes to start baking, I ended up making ABCs. Personally, I really found em cookie-licious .. totally different from the choc cookies I've ever made and this is the first time that I enjoyed eating my cookies. This is how it looks before I put the ABCs in the oven .. 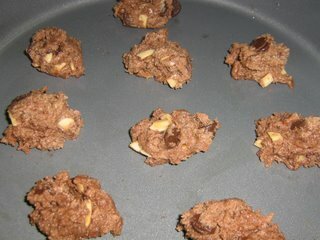 Here are the ABCs cooling off on a wire rack ..
Then fold in the almonds and choc chips. Place teaspoonsfuls of mixture on a non stick pan. Dun forget to space out for spreading.